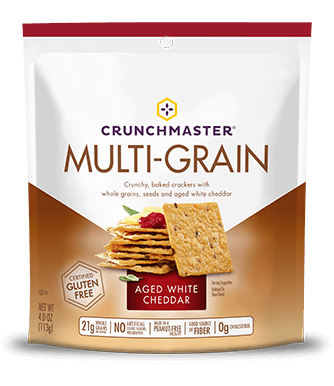 Crunchmaster Multi-Grain Crackers are a gluten-free alternative to processed wheat crackers. We start with a blend of whole grain brown rice, and add corn, oat fiber and a 4-seed blend. Then we oven bake our crackers and end up with 65% less fat than fried multi-grain tortilla chips. Try all three flavors with your favorite spreads and toppings or use the crunchy snack as an alternative to chips with your favorite dip. Our multi-grain crackers are made with the very best ingredients. Brown Rice Flour, Whole Grain Yellow Cornmeal, Seasoning (Salt, Toasted Onion Powder, Tomato Powder, Cane Sugar, Roasted Garlic Powder, Red Bell Pepper Powder, Yeast Extract, Spices, Silicon Dioxide [Anti-Caking Agent], Canola Oil, Citric Acid, Paprika Extractives [For Color]), Potato Starch, Safflower Oil, Oat Fiber, Organic Cane Sugar, Sesame Seeds, Flax Seeds, Millet, Quinoa Seeds, Torula Yeast. Brown Rice Flour, Whole Grain Yellow Cornmeal, Potato Starch, White Cheddar Seasoning (Whey Powder, Salt, Cheddar Cheese Powder (Cultured Milk, Enzymes), Sour Cream Powder (Cream, Nonfat Milk, Cultures), Dextrose, Maltodextrin, Buttermilk, Natural Flavoring, Soybean Oil, Baker’s Yeast Extract, Whey Protein Concentrate, Skim Milk Powder, Onion Powder, Spice & Herb, Malic Acid, Annatto (Color), Spice and Coloring (Contains Turmeric)), Oat Fiber, Safflower Oil, Cane Sugar, Sesame Seeds, Flax Seeds, Millet, Quinoa Seeds, Soy Lecithin. Brown Rice Flour, Whole Grain Yellow Cornmeal, Potato Starch, Seasoning (Cane Sugar, Sea Salt, Tomato Powder, Brown Sugar, Onion Powder, Vinegar Powder (Maltodextrin, White Distilled Vinegar), Paprika, Molasses Powder (Molasses, Silicon Dioxide), Applewood Smoke Flavor, Garlic Powder, Yeast Extract, Paprika Extract, Spice, Citric Acid, Canola Oil), Safflower Oil, Oat Fiber, Cane Sugar, Sesame Seeds, Flax Seeds, Millet, Quinoa Seeds.